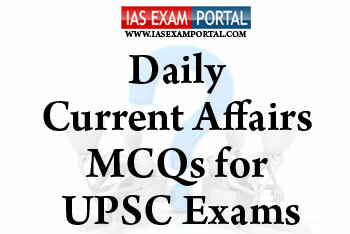 Current Affairs MCQ for UPSC Exams - 10 August 2018 | IAS EXAM PORTAL - India's Largest Community for UPSC Exam Aspirants. 1) The draft National Energy Storage Mission expects to kick-start grid-connected energy storage in India, set up a regulatory framework, and encourage indigenous manufacture of batteries. 2) The draft National Energy Storage Mission expects to kick-start grid-connected energy storage in India, set up a regulatory framework, and encourage import of quality batteries. 3) Central Electricity Authority is considering a draft regulation to make storage mandatory for large-scale solar projects ranging between 500 MW and 800 MW. Q3. The river is 720 km (450 mi) long and drains an area of about 74,500 km2 (28,800 sq mi) in Tibet, Nepal and Bihar.The river basin is surrounded by ridges which separate it from the YarlungTsangpo River in the north, the Gandaki in the west and the Mahananda in the east.Its unstable nature has been attributed to the heavy silt it carries during the monsoon season and flooding in India has extreme effects. Q4. Which of the following statements regarding NDRF (national disaster response force ) are true ? 1) NDRF is a specialized force, which has been created in the year 2006 for the purpose of specialist response during the natural disasters only. 2) Recently NDRF has raised 4 additional battalions 2 from ITBP & from BSF. 3) The ‘nodal Ministry’ in the central government for management of natural disasters is the Ministry of Home Affairs. Q5. ISRO is set to launch sateliites with an objective to monitor “Chlorophyl fluorescence” & radiation environment. Which of the following refers to chlorophyll fluorescence. A) It is the light re-emitted by chlorophyll molecules during return from non-excited to excited states. B) It isthe light re-emitted by chlorophyll molecules during return from excited to non-excited states. C) It is the light emitted when cosmic rays fall on white ice sheets. D) It is the light emitted when nuetrinos strike large opaque objects.